Throughout the years I have been fortunate to attend two KREATOR gigs, one in Wacken Open Air 2005 and in Israel in 2006. Watching this German giant play live was practically one of my life’s greatest moments, experiencing a legend in act, a legacy coming alive right before my eyes. Sheer Thrash aggression, pulsating melodic edge, head bashing and intense rhythmic arsenal, the KREATOR machine seemed to be battle ready at every occasion given. This time it was different, due to this particular gig, which occurred in 22.12.2012 (post-apocalyptic prophecy of destruction), Oberhausen, Germany, I wasn’t able to attended, and I am sure that most of you Metalheads out there wished that you could. But there is punch to all of this. 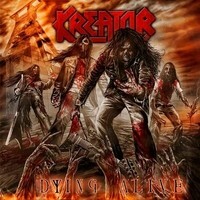 KREATOR summed up 45 gigs as support for their fiery and successful maniacal new album, “Phantom Antichrist”, with the filming of the Oberhausen showcase into a brand new live DVD that was entitled “Dying Alive”, via the band’s constant local label, Nuclear Blast Records. Through the course of ninety minutes of Teutonic Thrash mayhem, filmed by widespread 24 cameras right up to the people’s guts, I felt as if I was there, with the fanatic Oberhausen fans, breaking bones and hailing to the throne of the Teutonic Thrash kings. It felt like the third time around. Since it is my first official DVD review, I will try not to bore you with that much of technical terms, as I am not that of an expert myself. The first I noticed was the start menu of the DVD. With back tracks of the band’s songs with accordance to every section, along with amazing themed graphics out of the DVD’s main artwork, yet it seemed quite normal for the initial presentation. Enclosed within the menu is the full Oberhausen gig, consisting of 20 live tracks of KREATOR’s finest heritage with a hefty support for “Phantom Antichrist”, a section where you can select titled out of the full main gig, bonus video clips including the behind the scenes of the DVD and the “Phantom Antichrist” video and the two official videos of “Phantom Antichrist” and “Civilization Collapse” and of course there is the technical section of the “Settings” where you can set your sound system and sorts. Rather simple and to the point menu, easy to navigate and of course with the availably to listen to fragments of tunes. On throughout the Oberhausen gig, I noticed how amazing the footage superiority is. It footage style, which appeared moderately similar to the one displayed on the “Phantom Antichrist” video clip, seemed like a sort of vintage film yet with a heck of an HD quality. The 24 cameras involved covered everything, from the overall venue, through the inner pits of the stage (including the guitar cams that were simply overwhelming) up close to faces of the maniacal fans clashing in the battered moshpits and onslaught circlepits along with the first rows of those standing. The twists and turns of the cams were able to provide me the feel of the gig and how fortunate for the attendees to be there at the time. Sound wise, I anticipated nothing more than flawless engineering of the best quality, and I warmly received it. The engineering exertion on the recording seemed nearly perfect, everything was listenable and distinguishable and of course focusing on KREATOR’s latest sound template that has been so forceful and cutthroat. Furthermore, while tuning to the gig’s song list, you can activate the subtitles in order to memorize the lyrics of the tracks, quite handy I might add. Lastly, and for some reason it seemed quite in the far back of this review, this gig itself, without the technical clattering. KREATOR set a hefty piece of a setlist, letting their local fans immerse themselves with blood, sweat and tears over their new album’s tracks, mid era trackers alongside the older classics like “Endless Pain”, “Pleasure To Kill”, “People Of The Lie”, “Betrayer”, “Extreme Aggressions” and “Flag Of Hate / Tormentor”. “Dying Alive” is a destructive fest, nothing more, nothing less. KREATOR, with their social / political oriented lyricism and immense Thrash perception, revealed themselves as the kings of the hill, the true message of Metal’s glory and “Dying Alive”, KREATOR’s third DVD in number, is one hell of chunky proof that the oiled machine is strong as it can ever be, tall and on the edge of madness. Buy it now or you will miss a relic.